Sue Trinder is an orphan, left as an infant in the care of Mrs. Sucksby, a "baby farmer," who raised her with unusual tenderness, as if Sue were her own. Mrs. Sucksby's household, with its fussy babies calmed with doses of gin, also hosts a transient family of petty thieves-fingersmiths-for whom this house in the heart of a mean London slum is home. One day, the most beloved thief of all arrives-Gentleman, a somewhat elegant con man, who carries with him an enticing proposition for Sue: If she wins a position as the maid to Maud Lilly, a naiv̈e gentlewoman, and aids Gentleman in her seduction, then they will all share in Maud's vast inheritance. Once the inheritance is secured, Maud will be left to live out her days in a mental hospital. With dreams of paying back the kindness of her adopted family, Sue agrees to the plan. Once in, however, Sue begins to pity her helpless mark and care for Maud Lilly in unexpected ways ... But no one and nothing is as it seems in this Dickensian novel of thrills and surprises. --Publisher. Great story! submitted by ashflowtuff on July 18, 2011, 11:14am I love this book. The story is really great - you are taken on a wild ride from a couple different perspsectives, constantly trying to figure out what is the truth and what will happen next. The BBC mini-series is also enjoyable. Lesbian Romance submitted by Jen Chapin-Smith on July 22, 2013, 9:54pm "Fingersmith" tells the story of orphaned Susan, who helps her foster mother with various criminal pursuits in the eternal struggle to survive in Victorian London. When a man Susan and her foster mother call "Gentleman" (because they assume he's from an upper-class family) posits a plan to trick a wealthy woman into giving her money to Susan's den of thieves, the young woman agrees. The story takes some very unexpected twists but also has some very sad and scary parts. The scenes in the insane asylum are particularly disturbing, all the more so because they are based on the author's research and so are an accurate depiction. "Fingersmith" is a lesbian romance, so it does have some "R" rated scenes. It also has some very disturbing depictions of a child being forced to read aloud pornographic materials. If you like the novel, watch the movie of the same name. 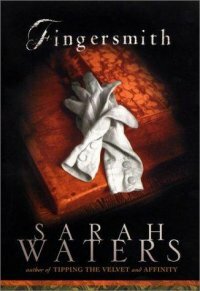 Also check out author Sarah Waters' other novels. New York : Riverhead Books, 2002. Description: 582 p. ; 21 cm.